Fresh tuna steaks are a fast and delicious dinner that even fish-haters around here approve of. 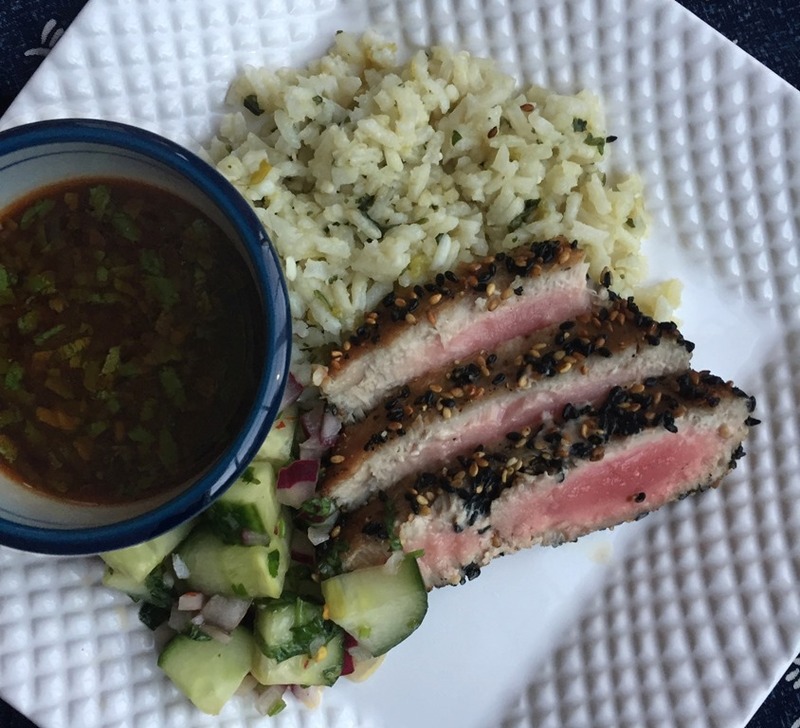 Fresh tuna steaks are coated in sesame seeds, quickly seared, and served with a spicy Asian dipping sauce. Tuna steaks are best served rare, so be sure you have all of your sides ready before starting to cook the fish. The main ingredients in the dipping sauce are soy sauce, lime juice, and chili paste. The strong flavors pair well with the mild fish. You can adjust the spice level to the taste of your family. Preparing the tuna steaks is super simple. Mix together some white and black toasted sesame seeds, and generously coat all sides of the tuna steaks. Cook for 2 minutes in a hot cast iron skillet, and you are done. Be sure and serve immediately, so that the tuna steaks don’t dry out. The best place to buy sesame seeds is an Asian market. You can buy large bags of white or black seeds relatively inexpensively. 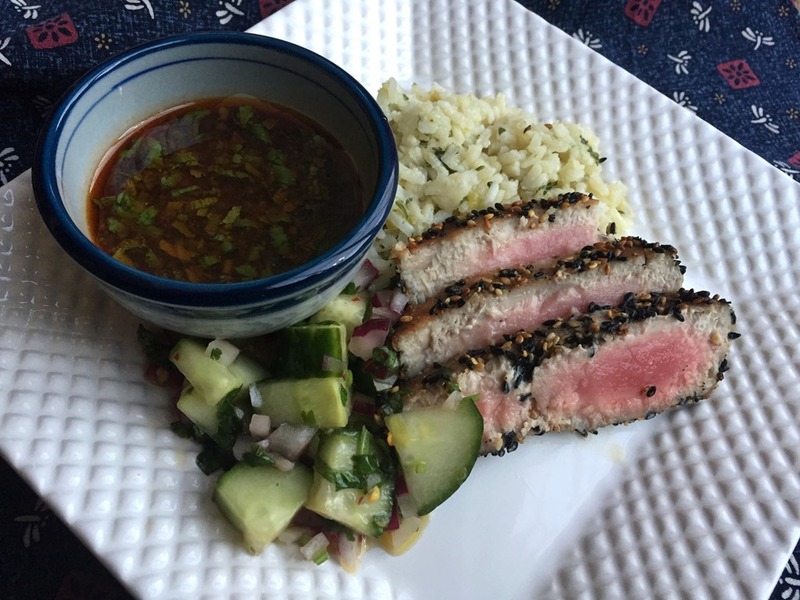 In addition to the dipping sauce, I served the tuna steaks with a Thai Cucumber Salad and Green Chili Cilantro Rice. Prepare dipping sauce: Stir together all of the sauce ingredients and set aside. Pat tuna steaks dry. Season both sides of the tuna steaks with salt and pepper. 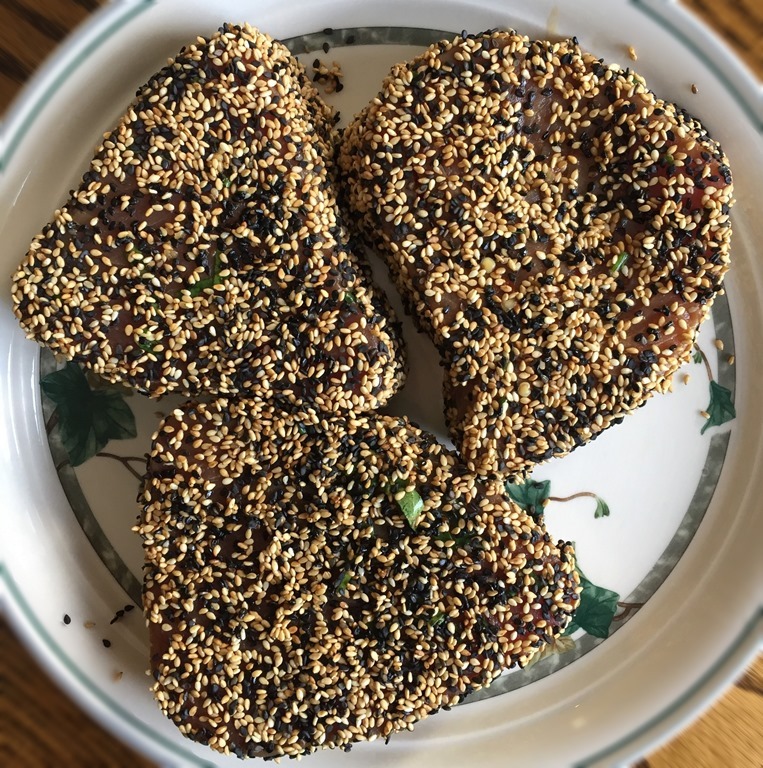 Place sesame seeds in a wide bowl and dip tuna steaks in seeds, pressing seeds onto all sides of the tuna steaks. Heat oil in a cast iron skillet until very hot. Add tuna steaks to hot pan. Do not crowd pan; cook in batches if necessary. Cook for 1 minute on each side. (Adjust cooking time if steaks are thicker, or if you want them cooked more than rare). Remove to serving platter. Cut tuna steaks diagonally into slices and serve immediately with dipping sauce. Mix sliced cucumbers, onion and cilantro in a bowl. Stir together remaining ingredients. Pour over cucumbers. Combine broth, green chilies, garlic, olive oil, and salt in a saucepan. Bring to a boil. Stir in rice, cover, and simmer over low heat for 20-25 minutes, or until rice is cooked. Stir in chopped cilantro. This can also be cooked in a rice cooker: combine all ingredients except cilantro in rice cooker and cook according to directions; stir in cilantro. Looking for something quick, easy and delicious to throw together for a last-minute dinner? 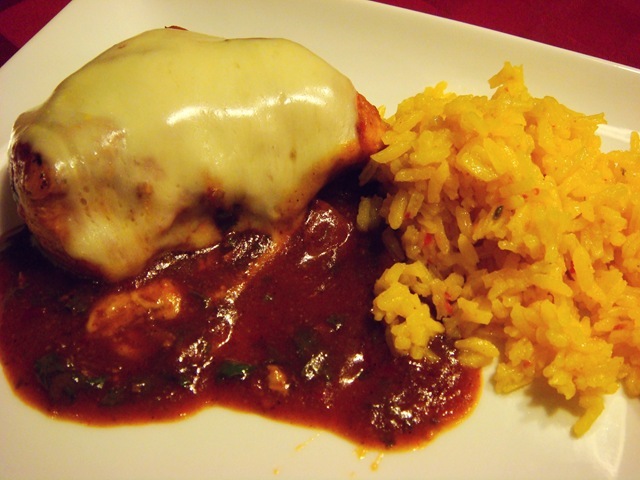 This Salsa Chicken has been the answer to many of my “Oh no! It’s 5 o’clock already! What am I going to cook tonight?” dilemmas. Simply brown some chicken breasts (generously seasoning with garlic powder, cumin and chili powder). 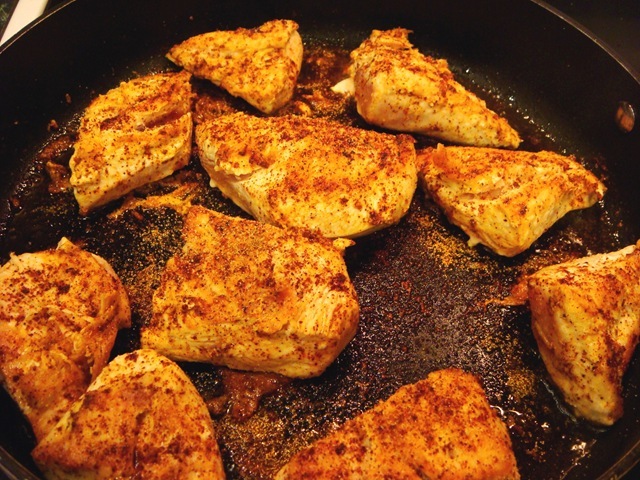 Mix together a jar of taco sauce or salsa with just a little cocoa powder and cinnamon and pour over your chicken. 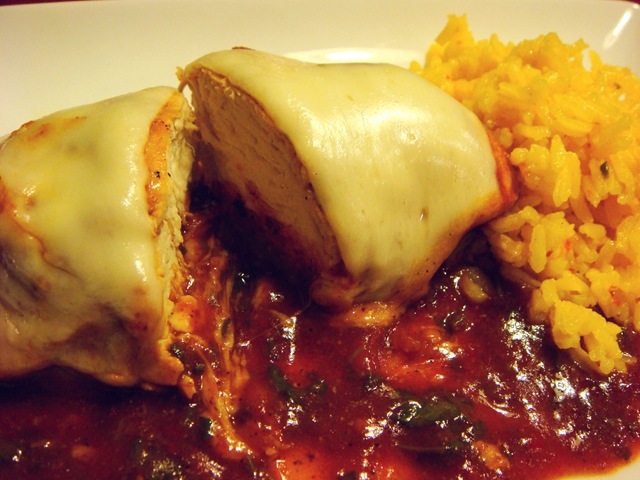 (since there is a lot of sauce with this dish, I use a mild or medium variety of taco sauce/salsa) Cover and cook about 10 minutes, or until chicken is cooked through. Stir in some chopped cilantro. Top with cheese – Provolone is my favorite, but I also use Swiss, cheddar or Muenster if I don’t have any provolone. Let the cheese melt and serve with rice. We like Vigo brand “Yellow Rice”, a mild saffron flavored Spanish rice. 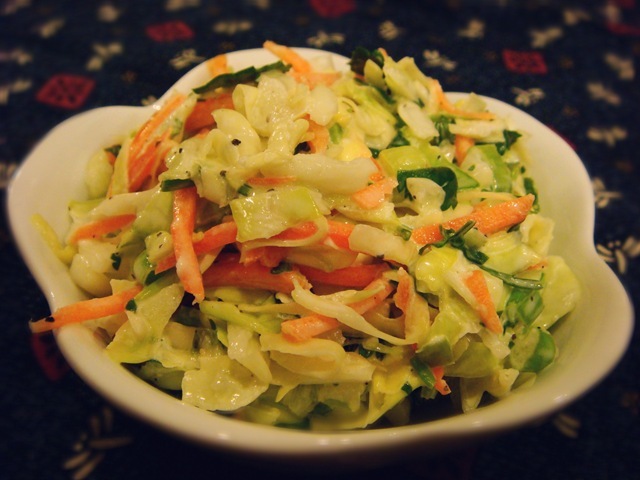 The coleslaw goes together really quickly if you use a prepackaged coleslaw mix. The pre-planning just comes in the grocery shopping part. Heat oil in skillet; add chicken. Sprinkle with cumin, chili powder and garlic powder (I don’t usually measure these spices; I just sprinkle them on both sides of the chicken). Cook until chicken is browned on both sides. Combine salsa, cocoa and cinnamon. Pour over chicken. Cover and cook about 10 minutes, or until chicken is cooked through. Stir in cilantro. 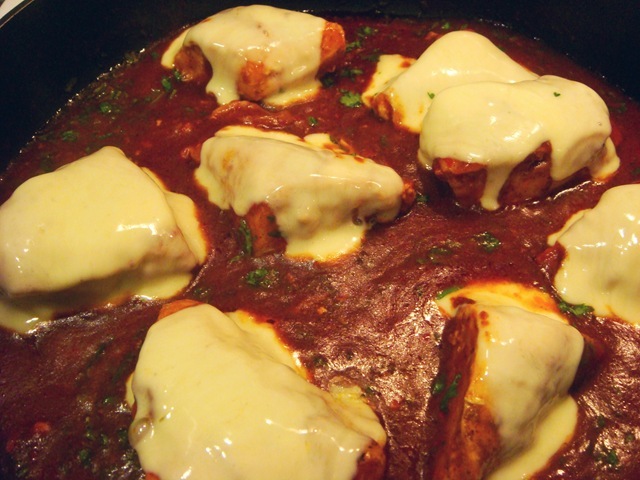 Just before serving, top each chicken piece with a slice of cheese. Cover and let cheese just begin to melt. Serve over rice (our favorite is Vigo brand “Yellow Rice”, a Spanish saffron flavored rice). Combine coleslaw mix, green onions and cilantro. In a small bowl, whisk together mayonnaise, lime juice, hot sauce, salt and pepper. Taste and adjust seasonings. Mix dressing into cabbage mixture. Serve immediately, or chill for a few hours.